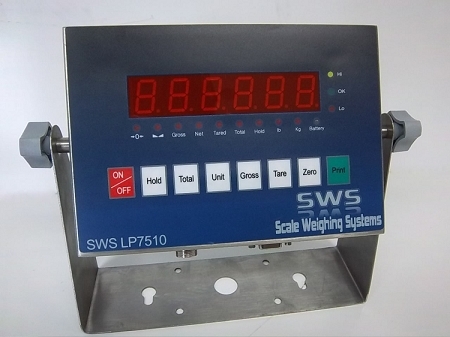 The Scale Weighing Systems, SWS-7630-LED Load-Bar System consists of two low profile weigh bars, with a stainless steel weighing indicator display. The units ease of portability, carry handles, and built in rechargeable battery, make this a truly portable and flexible weigh system. In fact, this system is commonly used for livestock weighing. Simply place the load bars under an existing squeeze chute or platform and you`re ready to weigh. 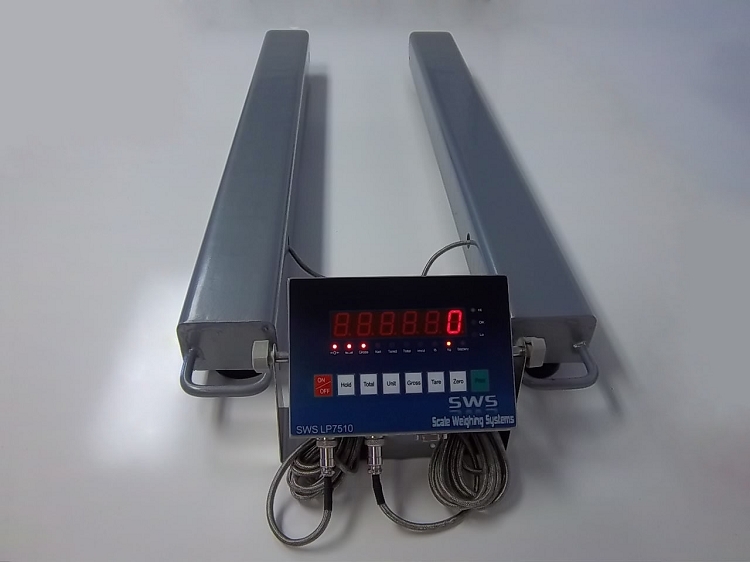 Designed for portable weighing applications in a variety of environments, the SWS-7630-LED load bar system is rugged & flexible and has a capacity of up to 5,000 lbs (see specs below). The two weigh-bars are only 3.6 high and feature adjustable leveling feet. The SWS-7630 system features two load bars w/ built in handles, and 18` of display cable, quick connector, and a NEMA 4X stainless steel digital indicator with a Bright Red LED Display. The load bars are made of painted carbon steel. They measure 4 wide x 3.6 high x 40 long and are designed to operate in temperatures from 14° to 104°. The system is ideal for weighing in remote locations, farms, livestock, or for any odd shaped products. The complete SWS-7630-LED System weighs approximately 83 lbs. So, it can easily be moved to another location, and it can be easily stored when not being used. The SWS-7630-LED Load Bar System has outstanding standard features. The stainless steel NEMA 4X digital weight indicator is operated by rechargeable battery (includes AC adapter/charger). The standard display functions include LB/KG, Tare, and Net/Gross. The indicator has a full duplex RS-232 connection for output to a printer or computer. The indicator also features an animal motion hold. This special software allows you to obtain an accurate weight even if the animal keeps moving on the scale. The indicator comes with a Wall/Desk mount stand that is portable or that can be mounted. An optional telescoping display stand ( pictured above ) is available and is adjustable from 39" - 60 " high.